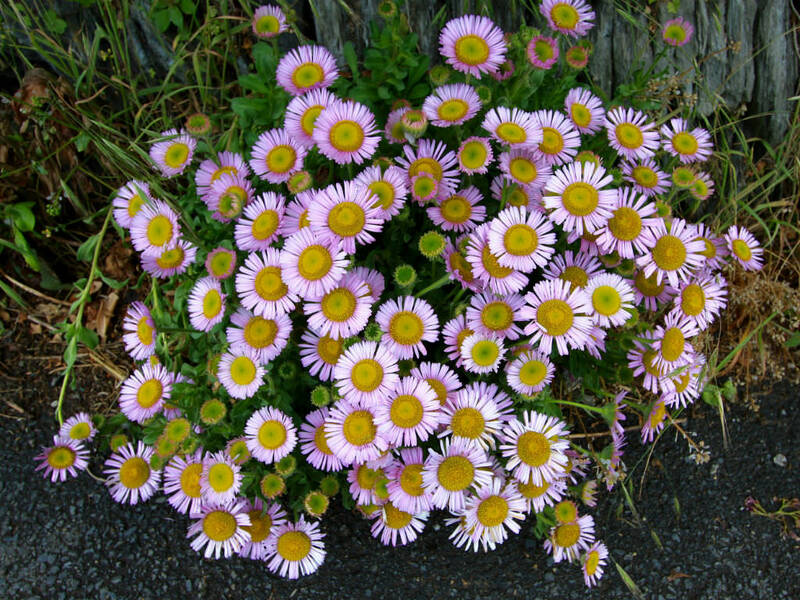 Erigeron glaucus is a perennial plant up to 12 inches (30 cm) tall, with branching, nodding stems which may be glandular and hairy to hairless. It grows from a stout rhizome and produces thick, firm, rounded to spoon-shaped leaves, sometimes with a few teeth along the edges, each two up to 5.2 inches (13 cm) long. Its stems bear inflorescences of one to 15 flower heads which are variable in size from 0.4 to 1.2 inches (1 to 3 cm) wide. 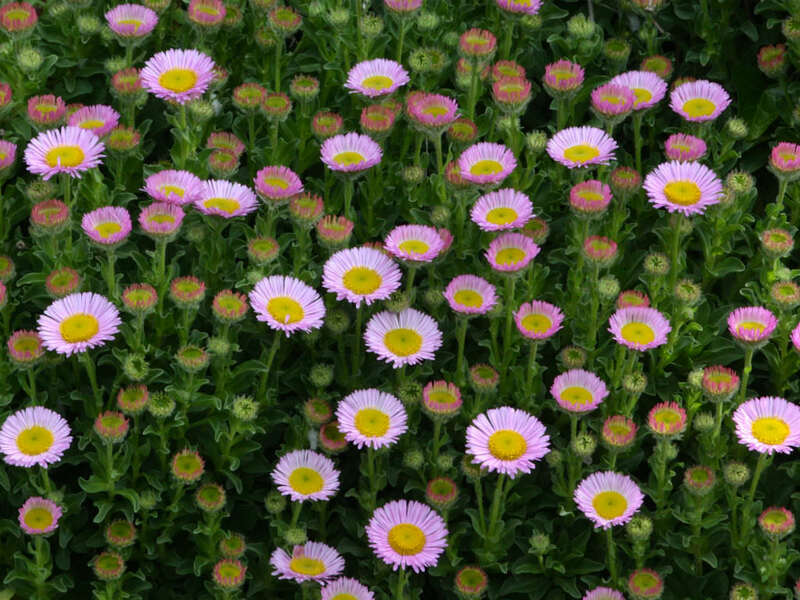 The centers contain golden yellow disc florets and the edges are fringed with ray florets which may be long or quite short, and are shades of deep blue and purple to nearly white. USDA hardiness zone 3a to 10a: from −40 °F (−40 °C) to 35 °F (+1.7 °C). 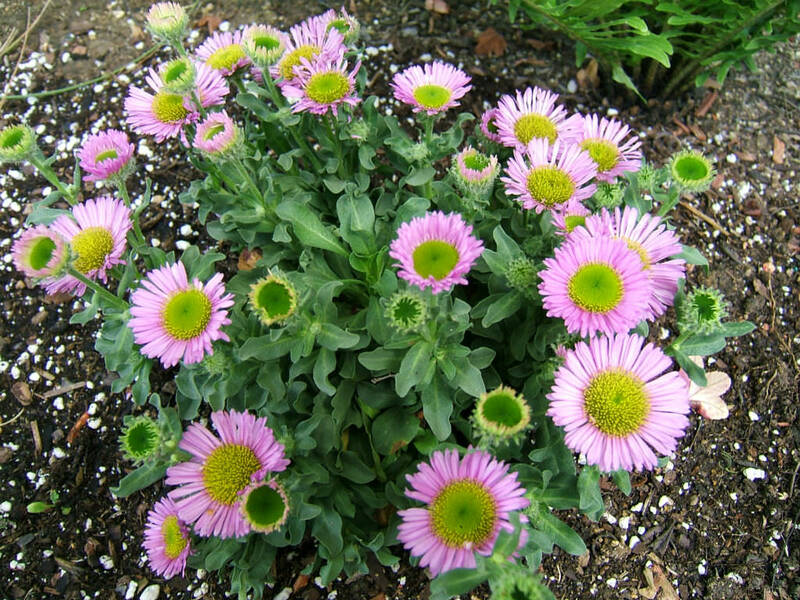 Growing Seaside Daisies prefer well-draining soil and full sun, but the plants will tolerate light shade, especially in hot climates. 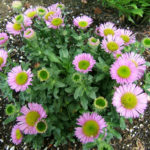 The plant is well suited for xeriscaping, and also works well in rock gardens, borders, flower beds, in containers and on slopes. 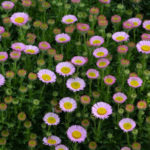 Seaside Daisy is highly attractive to butterflies and the colorful visitors love the long growing season. 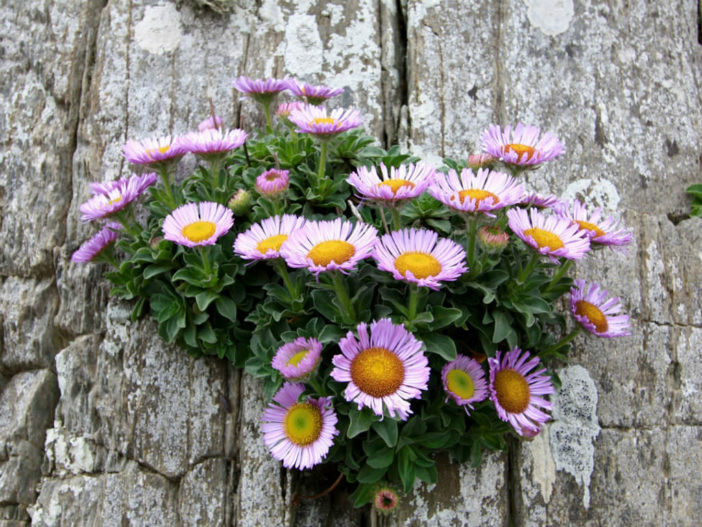 Seaside Daisy care isn’t complicated, but it’s important to locate Seaside Daisy where the plants are protected from afternoon sunlight, as the intense heat will scorch the plant. Otherwise, just water the plant about once a week during dry weather. A 3-inch (7.5 cm) layer of mulch keeps the soil cool and moist. 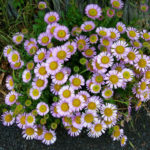 Native to the coastline of Oregon and California where it grows on beaches, coastal bluffs and dunes.